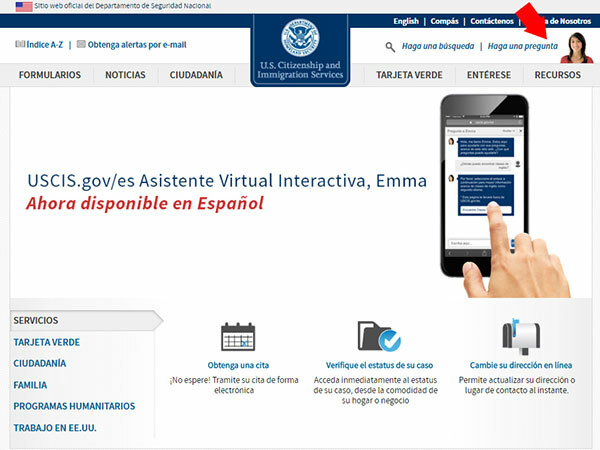 We are working hard to serve you and continue to make improvements to Emma, our Spanish-speaking Interactive Virtual Assistant. 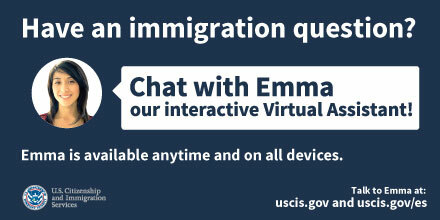 Help us improve Emma’s knowledge by continuing to ask your immigration-related questions on USCIS.gov/es from any device. This blog will help you understand a little bit more about how Emma works and how you can help her serve you better. 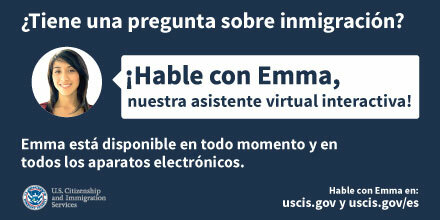 Our Interactive Virtual Assistant (IVA) “Emma” is available in English at USCIS.gov and in Spanish on USCIS.gov/es. Emma is not a live agent but an artificial intelligence conversational software built with customers in mind. You ask a question, Emma replies immediately with a response. Emma is here to answer your immigration questions and direct you to the right resource, and we need your help to make her even better. Emma is named in honor of Emma Lazarus, the poet whose famous words are inscribed at the base of the Statue of Liberty. Our IVA was developed in response to a growing interest in customer service self-help tools. Emma is not just a friendly face. She’s a powerful and innovative resource available 24/7 that can respond to your immigration-related questions in seconds. Emma joined USCIS.gov in December 2015 and since then answers an average of 456,000 questions a month on our English website. Emma made her debut on USCIS.gov/es in June 2016. In just two months, she has answered an average of 101,000 questions a month and is used nearly twice as much as the search feature on our Spanish website. We need your help to continue to improve Emma’s responses by continuing to ask your immigration questions. We’re constantly improving Emma’s knowledge base and answers through your questions. We encourage you to ask questions in your own words and in your native language so that Emma can reply better in the future. In this way, your language will become Emma’s language. If she doesn’t answer your question correctly the first time, try rewording your question. Emma in English currently can answer 90 percent of commonly asked questions. Even though the Spanish-language Emma is new, she can already answer 86 percent of questions, including those that use idiomatic terms and mixtures of Spanish and English. We are dedicated to serving you and excited to work with you as we continue to improve Emma on USCIS.gov/es. This article was also published by USCIS on their blogs—Beacon and Compás.